Technology disrupts for the better of those prepared. Legal practice is hardly impervious to the implications that technology brings. The advent of blockchain and machine learning technologies is an opportunity, and a potential cost if not pursued. Conversely, the use of technology is equally subject to legal regimes and institutions. Developing a sensitivity to the mutual interaction of the two forces is of utmost urgency as governments and peoples search for a firm footing. 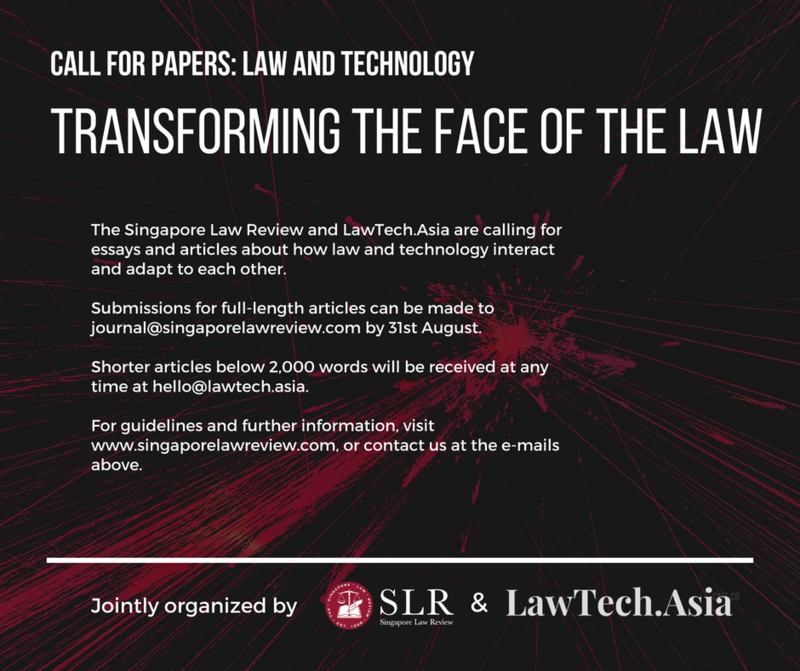 The Singapore Law Review (“SLR”), Asia’s oldest student-run legal publication, and LawTech.Asia, Southeast Asia’s foremost law and technology review, are collaborating on a special issue of the Singapore Law Review journal and LawTech.Asia online publication on the theme “Law x Technology: Transforming the face of the Law”. We will be accepting articles that are between 5,000 and 11,000 words in length. The topics can cover a wide range from the study of jurisprudence, to cutting-edge empirical research on legal matters, to discussions about recent legal developments, both locally and internationally. Authors may expect a review of the articles by leading academics in the field of legal technology. Selected submissions will be published in the upcoming Volume 37 of the SLR next year. For contributors keen on more concise and insightful articles, we will be accepting submissions below 5,000 words long for online publication. We welcome work which brings a unique perspective to the discourse surrounding law, technology and policy issues, and aim to enrich the community here and globally by re-centering existing discussions around Southeast Asia. Articles published on LawTech.Asia will also be published on the SLR’s online publication Juris Illuminae. Submissions can be made any time, and selected articles will be published on a rolling basis. The SLR is an independent legal publication run exclusively by students of the NUS Faculty of Law. We provide a platform for legal scholarship, with the aim of raising awareness of current legal issues and promoting critical legal thinking, writing, and discussion amongst students, academics and members of the legal fraternity. LawTech.Asia is an online publication that brings a unique perspective to the discourse surrounding law, technology and policy issues with a focus on Southeast Asia. The march of technological advancements is unrelenting. Yet, there is a paucity of understanding about how these developments will influence – and are influenced by – underrepresented regions such as Southeast Asia (SEA). Expect the latest on legal innovation, policy reactions or recommendations, thoughts on larger conceptual themes, and feature pieces of individuals on the forefront of these changes.